French Engineering Works (FEW) is a manufacturer, exporter and importer of standard and premium quality High Speed Steel Cutting Tools. The extensive product range stocked includes Taps, Dies, Drills, Cutters, Toolbits and Allied Lines. Special Taps and Thread Rolling Dies (Flat and Circular) are manufactured against request. 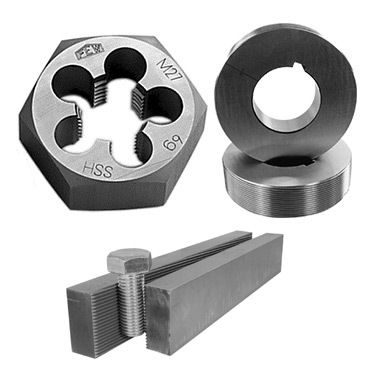 HSSE Application Machine Taps for through and blind holes in Stainless Steels, High Resistance Steels, Cast Iron and non-ferrous metals are available ex-stock. FEW manufactures to ISO, DIN and JIS specifications. The wide range of thread forms readily available include M, MF, UNC, UNF, UNEF, UN, NPS, NPT, BSW, BSF, BA, BSB, BSP G / RP, and BSPT RC. FEW products are exported to over 40 countries worldwide through a distribution network of stocking depots and exclusive agents.